Absynth offers three independent low frequency oscillators. These are no ordinary LFO’s since they offer some very unique features such as S&H mode and also like with audio oscillators in Absynth you can choose from various waveforms, you can edit and draw these waveforms, morph them in real time and also cross-modulate LFO’s between each other. Let’s first look into the main panel of the LFO. With waveform selector you choose the wave for the LFO. These waves are the same one you can choose for oscillator waveform. This means you can use complex LFO shapes, you can create your own shapes and even morph between two different shapes. With Sec mode you simply specify the rate of LFO in seconds. With Beat mode the rate of LFO is synced to master clock of your host. 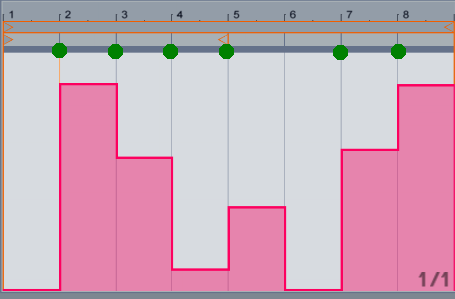 If the beat parameter is set at 1.000 this means the rate of the LFO will be 2/8 of a bar long. So to obtain the 1/8 rate you set the LFO rate in beat mode to 0.500, for 1/16 to 0.250, for 1/32 to 0.125 and so on. To obtain 1 bar long LFO cycle you set the rate to 4.000, for 2 bars to 8.000, for 4 bars to 16.000 and so on. With Phase you set where in the LFO waveform want your LFO to start after it is being re-triggered. LFOs in Absynth can operate in two modes. If LFO is in Mono mode then it modulates all the voices regardless of how many voices you are using in the patch. 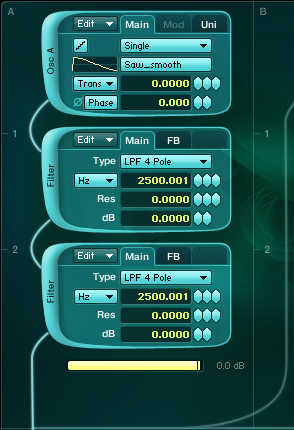 If LFO is in Poly mode than each voice has own independent LFO. If LFO is in poly mode it is always being re-triggered (at a point set with Phase parameter) with each new note played which is not the case if LFO is in Mono mode. To restart LFO in Mono mode you use re-trigger toggle button. Once you enable it you will see there is re-trigger MIDI CC available. This CC parameter restarts the LFO whenever the CC parameter goes from zero to any value and also when any non-zero value changes to any other other non-zero number. But the LFO won’t be re-triggered if the CC is constant or if CC drops from any CC value back to zero. In the picture below you can see green points in the timeline which indicate where the LFO would retrigger if we would use this CC for retriggering the LFO. Note that if this would be a loop it would also reset the LFO at the first beat of the sequence. I have tested this re-trigger behavior in Ableton Live (which offers only clip modulation for CCs) so if you notice any different behavior in some other host, please let me know. When LFO is in sample and hold mode you actually sample the waveform of the LFO at time interval set with S&H rate control mode. Again the rate of the sampling of the LFO waveform can be set in Beat or Sec mode as with the rate of LFO. In this case we have a LFO working at the rate of 6/8 of a bar and the value is being sampled from it at the interval of every 1/16 of a bar. This is very cool feature in Absynth since you can produce all kinds of semi-random and step modulations. 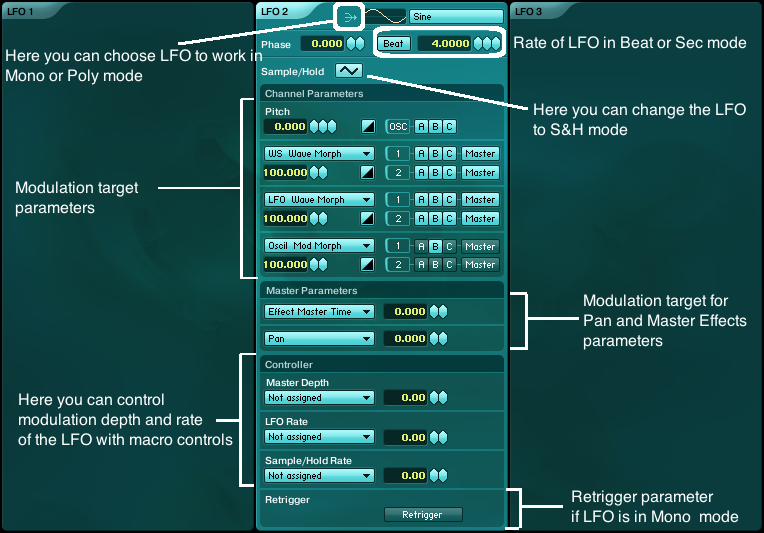 Here you choose the target parameters you want to modulate with LFO. The amount of the modulation is set with the amount parameter in percentage of the value to which the respective parameter is set. You can invert the modulation of any parameter with any of these toggle buttons. You can choose various parameters you want to modulate which are divided into various sections. Mod stands for Modulation effects (Freq shift and Ring-mod) and WS for Wave-shaper’s parameters. As you can see you can also modulate LFOs various parameters between each other (and even itself) and this way you can create some cool cross-modulation LFO effects. 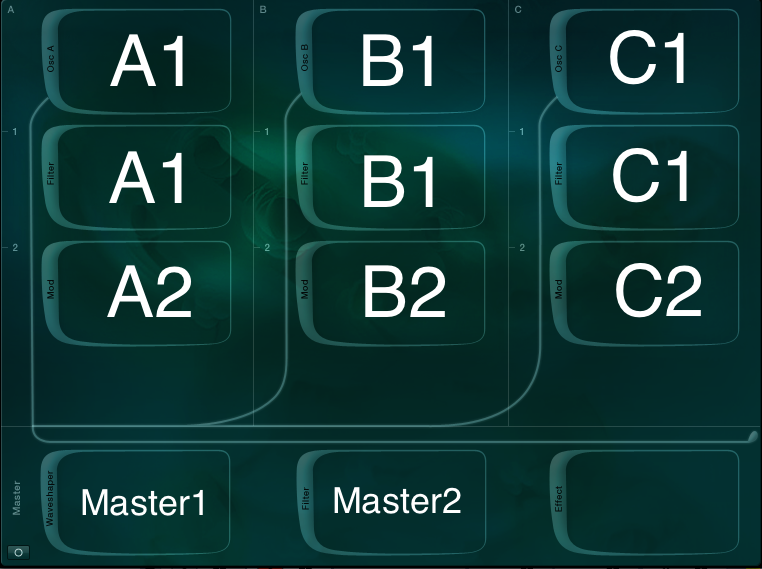 On the right you can see two rows of toggle buttons with letters from A, B, C and one master toggle button. This works as a modulation matrix. Since Absynth is a semi modular synthesizer you can use any of the filters or any of the audio modulation effects (Freqshift, Waveshaper and Ringmod) in any slot of Absynth except the very first one in A, B, C channels which are reserved exclusively for Oscillators and also in the very last one which is reserved for Master audio Effect. 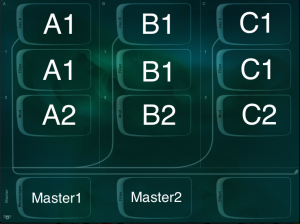 So for instance if you choose Filter Freq in the modulation target selector you can choose with these letters which Filter Freq parameter in which channel or master chain you want to modulate. The same goes for any other parameter. Ok, so why two identical rows? Because you can also have two filters on the same channel A like in the picture below. The same goes for any other parameters you want to modulate. Here is picture of which row to use to modulate any of the parameters in any of the slots. 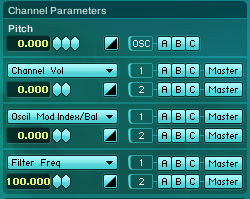 Here you can modulate Pan parameter and parameter in any of the Absynth Master effects (such as Resonator, Aetherizer, etc). These two are global for the whole patch so there is no modulation matrix needed. In the Controller section of the LFO you can assign LFO depth and rate and also S&H rate to any of the macro control sliders in Absynth. So you can effectively automate these parameters in you DAW or control them in real time. Once you assigned any of these three parameters to any macro slider you can edit the amount of the modulation in percentage of the value to which the respective parameter is set and also invert it. So as you can see these are no ordinary LFOs. They are great at so many things such as really long modulations for evolving sounds, complex rhythmic modulations, they also work great as a semi-random generators and many other things. We will explore some of these techniques in the next two sound design tutorials.